E. Angell on recent emphases in The Psychologist. Could there be some truth in Melanie Phillips' assertion in The Times on 20 June 2017, that ‘Compassion is being hijacked and weaponised in what is nothing short of a planned uprising against democracy itself’? If so, is The Psychologist playing a role as promoter and facilitator of an arguably dangerous form of political activism? Could it be said that it is acting as a useful conduit for some people who are keen to exploit psychology strategically in order to further the realisation of certain personal and collective goals? 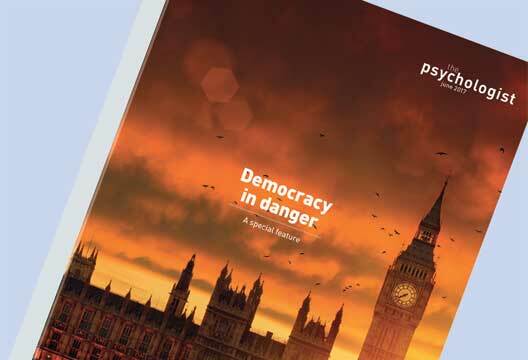 Why is there no exploration in June’s edition of The Psychologist, entitled ‘Democracy in Danger’, of either of two of the biggest threats to British democracy at present? Yes, I do mean the growing popularity of: (a) the intertwined religious and political ideology of radical Islam, which is striving to replace the legislation, legal systems, historical narratives, freedoms, values, traditions and culture of Western, secular states within the framework of global jihad; and (b) the politically extreme ideology beloved of Jeremy Corbyn and his coterie, which is linked to longstanding, anti-Western and pro-terrorism sympathies, consistent opposition to counter-terror measures and laws and calls for mass protest at the Conservative government’s austerity policies, the last led by the sectarian and faintly alarming-sounding Movement for Justice By Any Means Necessary with the aim of fuelling public anger, provoking insurrection on the streets, mounting a coup and placing Labour in power in order to overturn the result of the recent general election. I am also troubled by the failure in Roger Paxton’s article (‘Democracy in danger’) to make explicit, and provide any critique of, Thomas Piketty’s central thesis which is that economic inequality can only be reversed through state interventionism and the reform of capitalism. A web search reveals readily accessible scholarly articles which assert variously that Piketty’s stance is based on weak empirical, analytical and ethical arguments, data errors which skewed his findings and naive and utopian ideas. More damningly, a study by the International Monetary Fund found no empirical support for it at all while IMF economist Carlos Goes concluded, in a separate study, that the opposite trend was identified in 75 per cent of countries that were examined in depth.